Transformice is a flash game by Melibellulle and Tigrounette that focuses on little mice, determined to take a piece of cheese into their mouse hole. This website aims to be an exhaustive guide of the game, as well as a community fansite for the players. It groups tutorials for mice and shamans, screenshots and videos, the list of maps and its strategies, and lots of other information ! Welcome and enjoy your stay ! 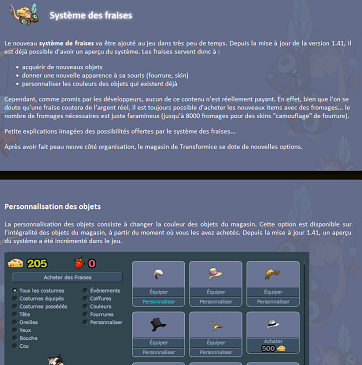 Découvrez le nouveau dossier fraises ! • Happy birthday Usb, you're now 24! • Happy birthday rexoutf, you're now 23! • Happy birthday LolLolTo, you're now 19! • Happy birthday Jean-Valjean, you're now 19! • Happy birthday essse, you're now 22!